Are there many variants among the 3 boys, Joe? Last edited by ALR-bishop; 03-08-2019 at 10:38 AM. Speaking of boys and variations, I have two boys whose greatest variance is their age, one is in 3rd grade, the other 6th. However, as of last week they were the same height and within a pound of each other. When they play on the same team they are routinely mistaken for each other....to avoid this, my younger son decided to wear his socks high to differentiate himself from his brother. This year they will be on different teams, thankfully. Thank you Al, appreciate it. 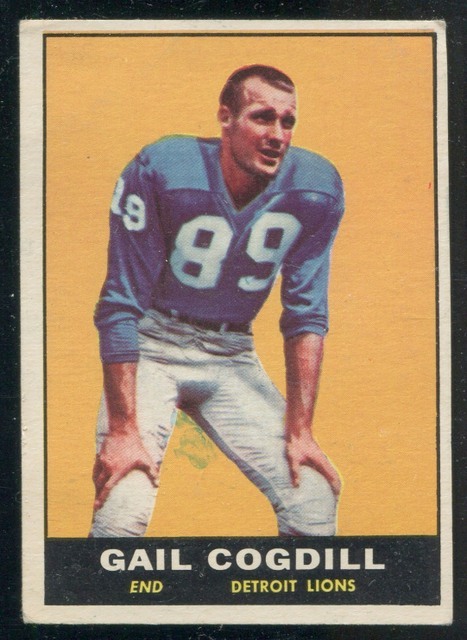 Neither of my spiked 57 Crandall cards have the blue haze(?) ...... can you post the different 60 Crandall variations you have? 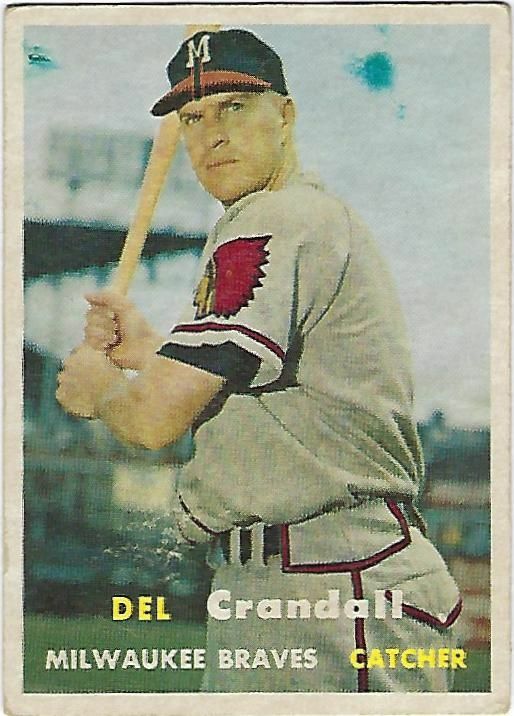 Does that mean that the 58 Musial is a "triple print"? I believe I read before that Topps celebrated that they finally signed Musial to a contract by triple printing his first card, the 58 All Star card. 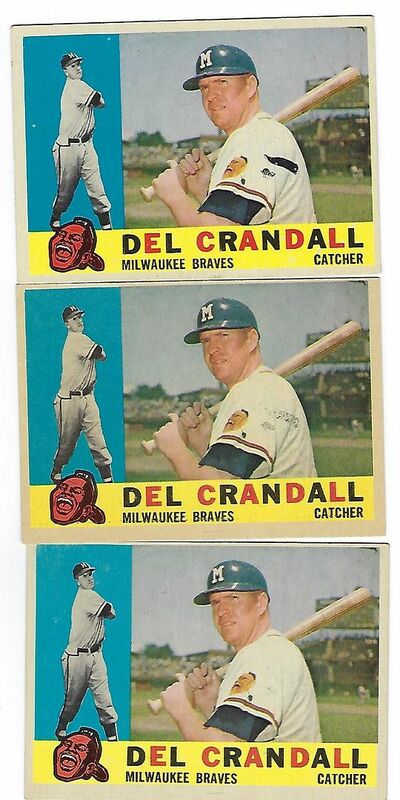 ETA, I think those are the also triple printed 1958 Mickey Mantle All Star cards under the three Musial triple printed cards in the scan. Thank you Irv, appreciate it. Thank you Al for posting, I have 5 of the top copy, but none of the middle.....this variation appears to be similar to the 78 Wills variation, a reverse progressive, when Topps tried to remove the "mark" they didn't get all of it and subsequently created another variation. I can never tell if such marks were intentionally addressed or simply were errant ink that faded away on it's own in the printing process. .....this variation appears to be similar to the 78 Wills variation, a reverse progressive, when Topps tried to remove the "mark" they didn't get all of it and subsequently created another variation. I have a conspiracy theory on the 1978 Topps Bump Wills circle variation card that I don't believe I have read anywhere else and I could be wrong, but I have always thought that the first version of the card is the one with the noticeable print dot in that area, the second version is the card with the large circle drawn around the print dot that was done by a proofreader for the dot to be removed but was mistakenly also printed that way for quite a bit of the press run, and then finally the third corrected version where the proofreaders black circle and the errant print dot were both airbrushed out. Here is something similar. 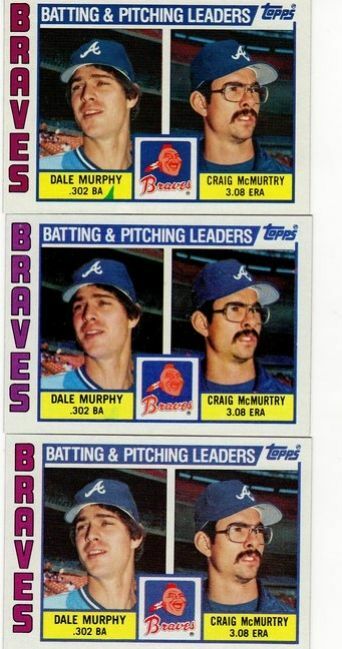 The blue mark next to Murphy's 302BA dissipates in the 2nd card and then disappears on the 3d one. Intentional intervention or just a print defect that faded away ? The Brave TL is a head scratcher because the Nestle version (at least all of the copies I have seen) have the green sliver. My "guess" is that the Nestle set was produced after the regular 1984 Topps production ended. You would have thought that the green sliver would not have appeared on the 84 Nestle copy as it was removed from the regular Topps version and did not appear on any of the Tiffany copies I have. Cliff, I think your theory will hold water....it makes more sense than a proof reader wanting the trophy moved more to the left....as it never was. Until today, that was my conjecture. The irony is that the circle was far more detrimental to the appearance of the card than the tiny print dot. The likely 3rd of 4 variations, the one with the circle mostly removed and the print dot still present, indicates that the QC folks at Topps still did not remove the print dot until after they completely removed all signs of the circle. Noticed this recurring, partially obscured "K" in "Hendricks". Seems to be a lower pop print variation. Actually, yes, Al. All three were born within 32 months of each other. The first is a red head like mom, the second has dark brown hair like mine, and the third is a blondie. And yes, all with the same mother. We call them Neapolitan, lol. Here is a HOFer print variation I have not seen before. This 70 Topps Juan Marichal has some sort of bluish print spot taking up most of his upper right arm. The blobs (each of blob appears unique) are themselves recurring but limited.